Tonight I was sewing to help melt the worries of work away. Sometimes a little sew time is all I need to lift my mood and sometimes that sew time is surprisingly productive. 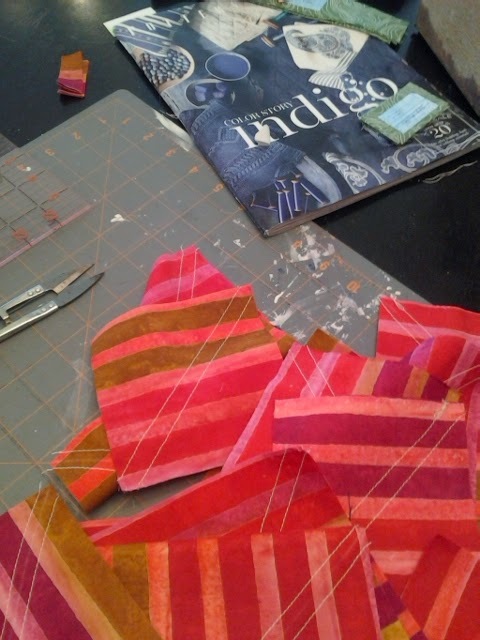 I've been working with this great stripe fabric that has had me on a quilting roller coaster ride. 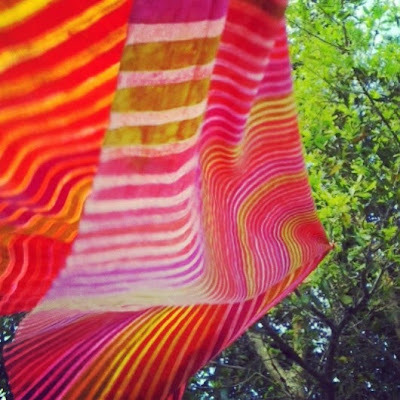 I hung the fabric from a tree while I doused it with starch. It's a new technique that I think I will be adopting for future endeavors. I love how stiff and almost paper like the fabric has become. I was headed to the peak of the lift hill as I purchased the yardage, dreaming about how I might use it. I zoomed down the first hill to a low when I realized the fabric has too many variations to experiment with this graphic quilt design I've been playing with. I banked to the left and through a loop when I came up with a new idea, then the coaster plunged lower as I realized I was not using my fabric wisely. 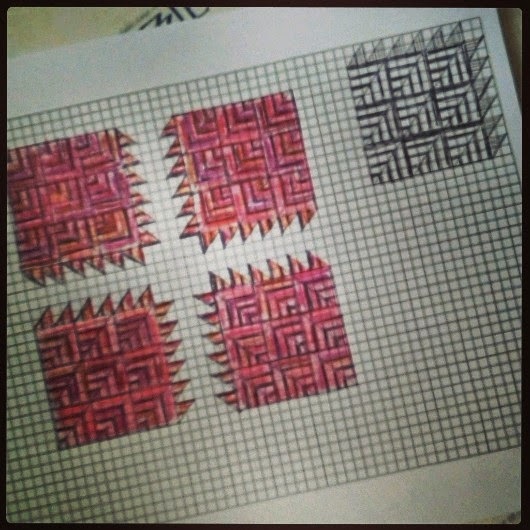 My new idea, which may become the center for a medallion style quilt. I'm still not sure. 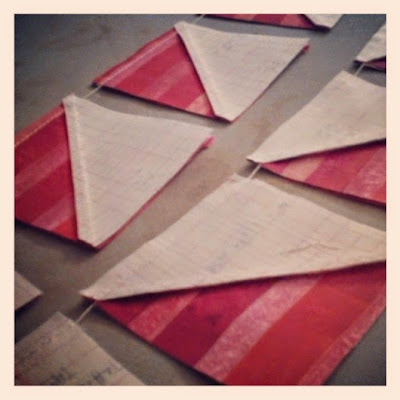 I was following the method of making half square triangles (HST) whereby you take two squares of fabric, placing them right sides together and draw a line diagonally from one corner to another, stitching 1/4" on each side of the line and then cutting them apart. 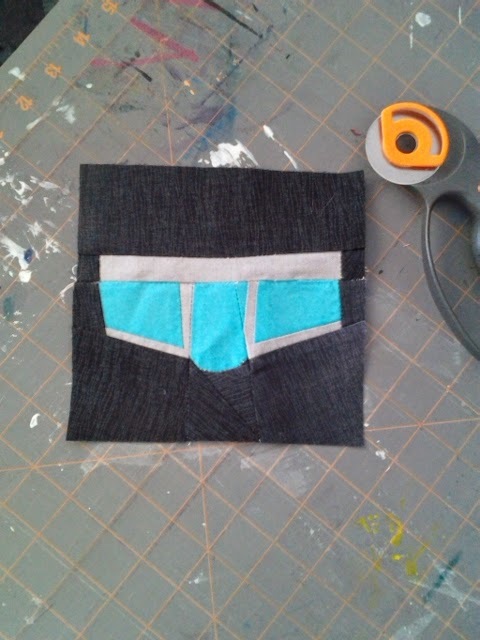 It wasn't until I had 48 of these that I realized how important it was to take note of the direction of the diagonal line when using a striped directional fabric as one the squares. As you will see in the final picture of this post I need some of these HST that have stripes that go in one direction, and other HST that have stripes in the other direction. Fortunately, (if I may continue my roller coaster metaphor) I think I've reached a second lift hill in this ride and am ready for the twists and turns that will follow. I have one portion of my design complete! I think this progress calls for a little party. 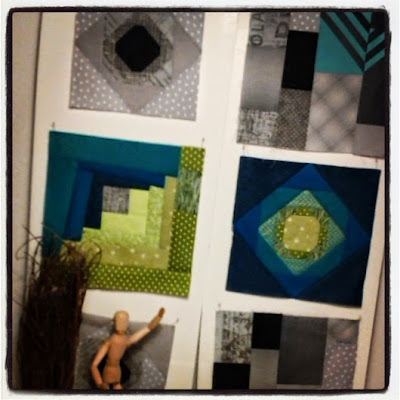 I'm linking up with the WIP Wednesday Party at Freshly Pieced Modern Quilts. I really hope I make a win from Canton Village Quilt Works, the sponsor of the party. I have heard that if you put goals in writing you are more likely to reach them. Your chances of meeting those written goals increase more if you share them with others. I am ready for that motivation. Luckily, I happened upon the lovely Katy Cameron at the The Littlest Thistle. She has organized this fantastic Finish Along. It's a little party where the festivities begin by sharing your goals, chat with some other quilty friends, play a little music, comment on the progress being made, have a glass of wine, stitch and play on your own projects and at the end share in the joy of all the successful and complete projects you have! It's the first time I've joined, but it sounds like a great time. You will have to provide your own music and wine but the hostess has rounded up some great prizes and parting gifts. What would I like to finish before July 6th? This quilt has been boxed up for about 7 years. Currently it's getting a breath of fresh air, then it needs batting, backing, quilting and binding. A twin size is a nice size for a lap quilt in my 6'4" opinion. The finished top of last summer's project. 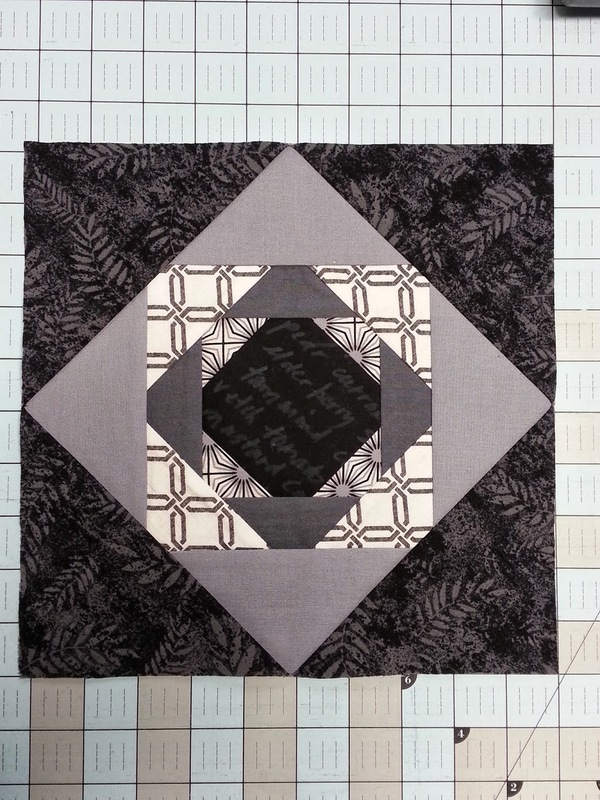 A project using the Summer Sampler Series and Solstice Star Series at Fresh Lemon Quilts. The pieced backing for last summer's project. 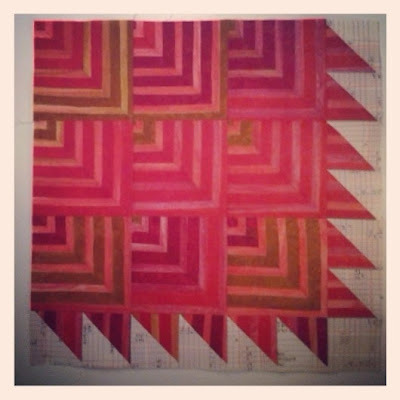 I started this quilt last summer as I dipped my toes back into the quilting water. The summer was the perfect time to make the top and the back. 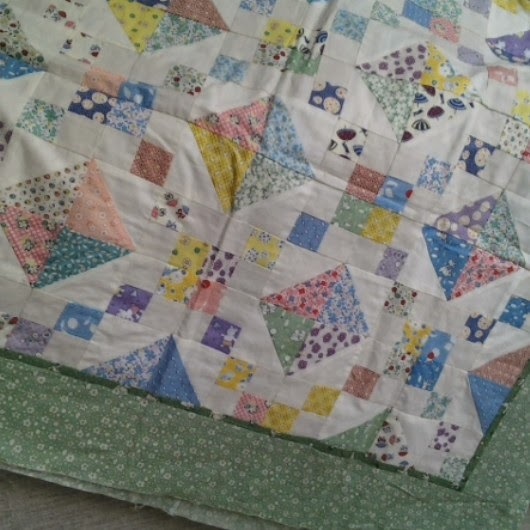 I decided to try my a little hand quilting on this, and sadly can't remember when that part of the project started. I worked on it almost non stop over winter break from school, but it still needs to have the quilting finished, trimmed and binding added. This was a little experiment in striped fabrics. I am really happy with how it has turned out, but I still have to figure out what to do to finish it. I know that it will need batting, backing, quilting and binding. I have yet to decide if there will be borders involved. I also need to do some better photography and make sure there aren't crazy cords in the shot! These are some striped half square triangle (HST) that I have started for this project. 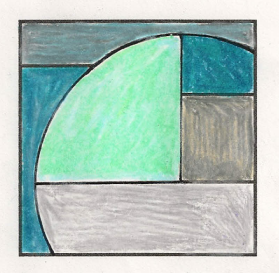 This is a rough drawing for the central portion of this quilt. I'm not sure what it will become. I was inspired by this fabric when I saw it at Quilting and Sewing Expo that I attended a couple of weeks ago. I had to have some and have started with an idea. I'm not really sure where it is going, but know that this project will be a lap style quilt that will be a gift for someone who is shorter in stature than myself and may not require a twin size quilt. 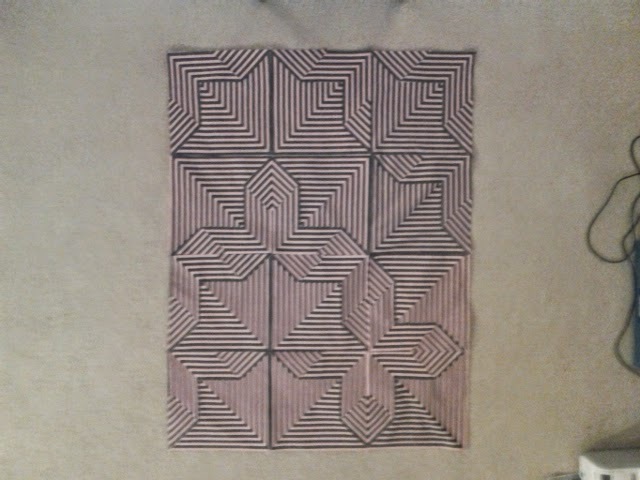 I will have to finish the design, finish piecing the top, figure out the backing situation, batting, quilting and binding. I'm not going to lie, this will probably be a project that will roll over to the next quarter, but I can dream! My original design for Under-Ruse. My partner, Shark, has requested a wall hanging of this design. It will be made of scrap fabric or something that he decides upon. Honestly, this is stretching my creative imagination to even add this project to the list. If I could play hooky from school all the time, I know I could make something of this too during this quarter. I'm going to give it a go! I will need to piece the top, bat, back, quilt and bind! Eek! As I scroll back through this ambitious list, I can't help but wonder what I'm getting myself into. If you care to join me, stop by The Littlest Thistle before April 14th to find out all of the details. I hope to see everything you would like to finish as well! I remember one of my painting instructors in college asked if I 'blogged.' At the time, I didn't. The word seemed foreign, the concept was strange. I couldn't buy into it and I couldn't see how my teacher (of my parents generation) would be into this online community! I guess that is what I failed to understand from the get go: Community. My understanding was that it was a journal of sorts, a place for you to record your thoughts and experiences, not unlike a diary. I have since learned that the blog is much more about community. A block I designed for a contest that I heard about in the blog world. I am able to record those thoughts and experiences, but they are along a much more specific topic than I first imagined. I am also able to partake in the postings of so many others who share similar interests with me. I am learning that there is discussion in the comments, there are familiar names and faces, and there are friends who challenge you and help you grow. Each picture in this post is something that would not have been created if it had not been for blogs! A block made by Carole Gold at Fresh Off the Frame using a technique that I wrote about on my blog. In the spirit of learning, growing and community, I excited to join the Small Blog Meet at Lily's Quilts. I know that here I will find more inspiration, stories, challenges and conversation. My design wall featuring WERQ Bee sample blocks. What have you created that would not be if it had not been inspired by your bloggy adventures?